Fitbit fitness tracking company has this week announced the launch of a new Fitbit Windows 10 application that brings with it support for the Cortana personal assistant and more. Fitbit also unveiled this week that they are currently in the process of developing a new Fitbit Xbox One application that will be available for users to access before the end of the year. • Updated live tiles that have been redesigned with more information and new notification types to let users quickly access their most critical data to better enable them to reach their personalized health and fitness goals. • Quick actions to help users log and track their health and fitness activities, such as food, water intake and exercise, as well as set alarms more efficiently with the simple click of a button, encouraging more frequent logging. • Cortana support allows users to speak commands on Windows 10 tablets, PCs and mobile phones — such as “Fitbit, I ate chicken for dinner” or “Fitbit, I went for a three-mile run” — for automatic and easier food and activity logging. • Notification center now consolidates all users’ important notifications and messages in a dedicated tab making it effortless to review progress, or stay motivated with cheers, taunts and encouragements from friends and family. • Enhanced syncing with Bluetooth on all Windows 10 devices with supported hardware provides users with quicker access to their health and fitness stats, so they can make timely decisions to reach their objectives. • Universal design and continuum support allows users to customize and effortlessly view their most important personalized data in real-time with an enhanced visual experience adjusted for whatever Windows 10 device they are using. 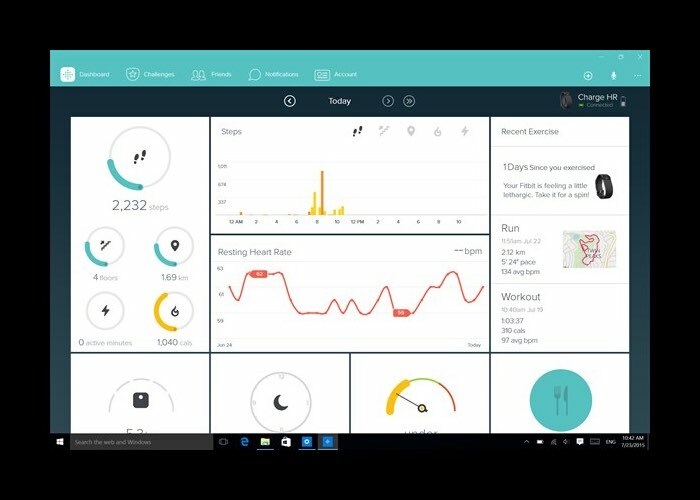 Jump over to the Microsoft Store to download the latest Windows 10 Fitbit application.